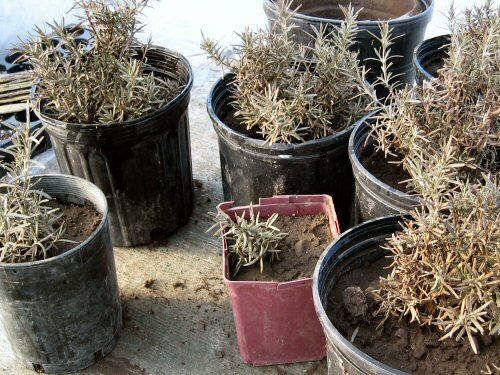 Rosemary, potted in the Autumn from the herb beds, has taken a bit of beating and probably not survived. It’s weathered several intensely cold nights already, out here in the unheated greenhouse, and I kinda wanted to see if they could make it through the winter. What a difference last night made, not colder than any others, it’s probably the night after night that got ’em. Well, inside they go to see if there’ll be any miraculous recoveries. Oh, poor rosemary. I’ve had two lovely plants die this year also… the sudden cold snaps are just awful for them. Did they ever come back? I get conflicting stories about how cold tolerant Roemary is. Seems to weather the winters here which will occasionally get around 18 degs F.